You always dreamed to be a real Mafioso? So this game is made for you. All you have to do, is to shoot and kill a numerous enemies. But it is not as easy as it seems, so you will have to show all you skills to reach success. Are you ready for skirmish? A real Mafioso is not afraid of no one and nothing. Inclusive a lot of armed men. This shooting game relies on physics to accomplish its task. You have a chance to become a real gangster and show everyone who you are. 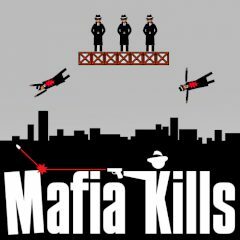 Your mission is to kill all enemies at each level shooting with your gun. But you mission will be very difficult, because your targets are closed by obstacles and you have limited bullets. Show your wit and safety to reach success. Sometimes the solution is closer than you can even imagine. Use your mouse to play. The time is not limited. But the score depends on your quickness. So hurry up! Do not worry if you make a mistake! You can restart the level and try to pass again. Think carefully and try to remember the laws of physics and gravity, before making the shot.